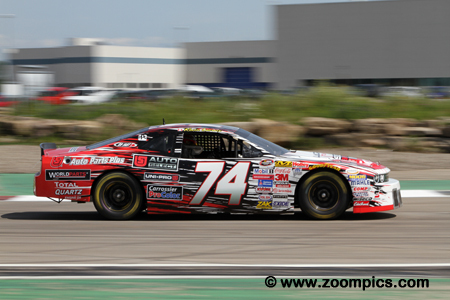 Round four of the eleven contested during the 2015 NASCAR Canadian Tire season took place at Circuit ICAR. The track is built on the runways at the formerly active Mirabel International Airport. The Ecko Unlimited 100 would be contested for thirty laps around the fourteen-turn 2.113-mile road course. This event had the distinction of being the first caution-free NCATS race. 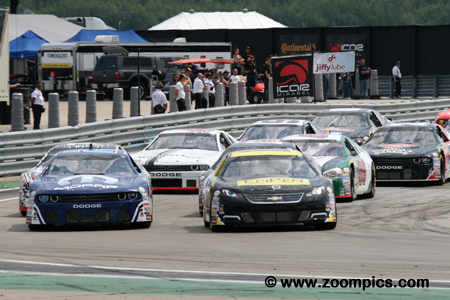 The front row at Circuit ICAR was occupied by pole-sitter, Alex Tagliani in the No. 18 EpiPen/CGI/CanTorque Chevrolet Impala and the Mopar Dodge Challenger driven by two-time NASCAR Canadian Tire Series champion Andrew Ranger. Tagliani would lead the twenty-three starters for two laps before he was passed by fourth place qualifier and eventual winner, Kevin Lacroix. 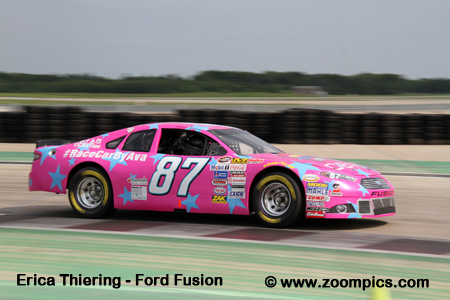 Rookie, Kevin Lacroix was the man to beat at Circuit ICAR. 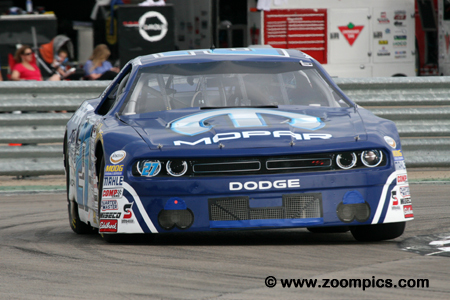 The driver of the Tuning/Excellence Chrysler Dodge Challenger was fourth quickest after the qualifying session. It only took two laps for Lacroix to move into first place. He would stay in the lead for the remainder of the caution-free race and win by a 0.869-second margin. Defending race winner, Andrew Ranger was quickest in the final practice session. Unfortunately, for Ranger, his performance during the qualifying session dropped off slightly and he started in second. During the race, he was able to slip past Tagliani when Kevin Lacroix took the lead. The driver of the Mopar/Pennzoil Dodge Challenger finished second. Defending series champion, Louis-Philippe Dumoulin put down a time that was sixth quickest in qualifying. 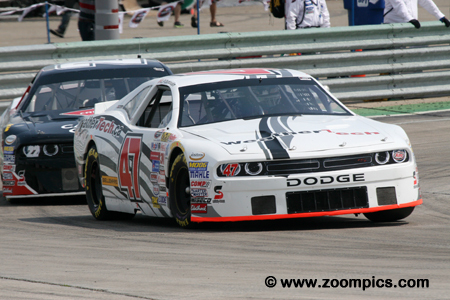 During the race, Dumoulin, driving the WeatherTech Dodge Challenger, ran with a group that included – Gary Klutt, Scott Steckly, Alex Labbe, Marc-Antoine Camirand and D.J. Kennington. At the checkered flag, he finished on the lead lap in fourth place. Elie Arseneau only made one Canadian Tire NASCAR start during the 2015 season. However, the Director of Sales at ICAR Experience put his local knowledge of the track to good use and qualified third. 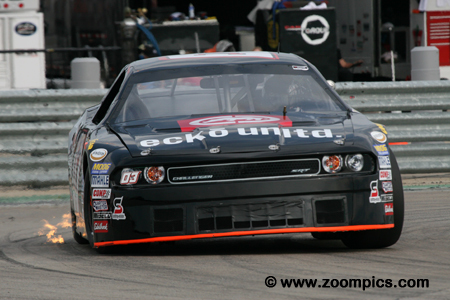 Unfortunately, Arseneau could not showcase his talents in the race as the Ecko Unlimited/Circuit ICAR Dodge Challenger developed a rear-end issue – forcing him to retire after sixteen laps. Jason Hathaway qualified with the first of two groups and was the eighth fastest. After the second group had completed their session, Hathaway found himself nineteenth in the twenty-three car field. However, he was moved to the back of the grid after the team made unauthorized changes to the car. Hathaway drove a solid race and passed twelve cars on the way to an eleventh place finish. 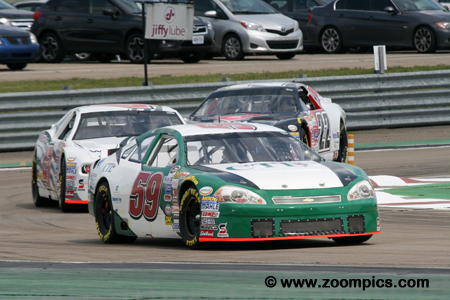 The winner of the season opener at Canadian Tire Motorsport Park, Gary Kutt, turned the fifth-fastest qualifying time in the CTL Corp/Legendary Motorcar Chevrolet Monte Carlo. Despite some position changes around him, Klutt was in fifth place at the mid-point of the contest. As the race came to an end, he was passed by Scott Steckly and Marc-Antoine Camirand. Klutt was eighth at the checkered flag. 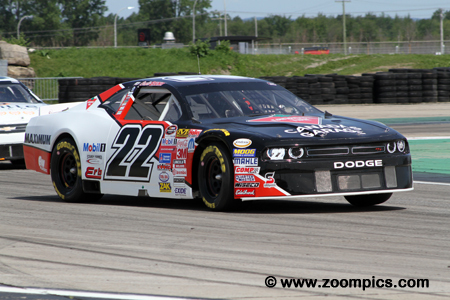 Three-time NASCAR Canadian Tire Series Champion, Scott Steckly was, just 0.753-seconds slower than pole-sitter, Alex Tagliani which placed, seventh on the starting grid. During the race, Steckly gained two positions when Eli Arseneau retired and he passed Gary Kutt. At the conclusion of the event, he was in fifth place. Round two winner, Alex Tagliani was near the top of the time sheets during the three practice sessions. Tagliani saved the best for last and in qualifying he was the fastest and started on the pole position. At corner-thirteen, on lap-3 of the race, Tagliani was passed by Kevin Lacroix and Andrew Ranger. These passes dropped him to third place which he maintained to the checkered flag. In the final practice session, Marc-Antoine Camirand was the quickest rookie. This was no surprise as Camirand has a tremendous amount of experience and success in a number of road racing series. Unfortunately for him, the performance of his competitors improved during qualifying and he started in the eighth position on the grid. Driving the Grafoid/Braille Battery Chevrolet Impala, Camirand finished seventh.